After four weeks of reading “Because of Winn-Dixie” by Kate DiCamillo, Bell Top students finished the book together at an assembly on Wednesday. 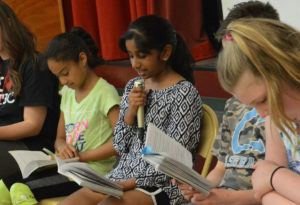 Four 5th graders served as guest readers and led the school in reading the final chapter of the book. Throughout this year’s Bell Top Book Club, students read together and had rich classroom discussions, they answered daily trivia and winners got to take home the Bell Top Stray stuffed animal. They also created a “mistake tree” where students put a mistake inside a bottle as a way of letting it go. Special thanks to Bell Top teachers Tracy Cornell and Sarah Lussier for organizing the Bell Top Book Club and to the Bell Top PTO for providing each student with their own copy of the book.